Departs: From May to Oct.
Meet your guide and driver at the Xian airport, and then transfer to the hotel. 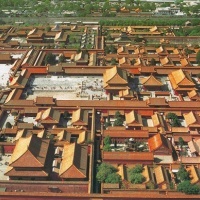 After that, pay a visit to the Xi'an Ancient City Wall and the Shaanxi Provincial History Museum. 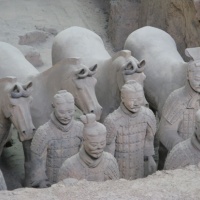 Full-day visit to the Terra Cotta Warriors and Horses (include golf carts), the Big Wild Goose Pagoda and the Banpo Neolithic Village. In the evening, enjoy the Tang Dynasty Song and Dance Show at Tang Yuegong Theatre. 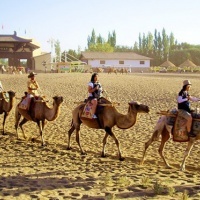 In the morning, be escorted to the airport for the flight to Dunhuang. Be met and transferred to the hotel. 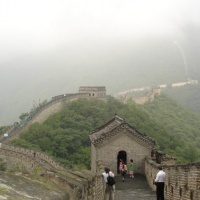 Then visit the Hechang Military Depot followed by the Great Wall of the Han dynasty. After breakfast, you are picked up to see the Mogao Grottoes. 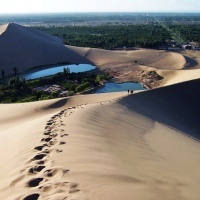 After that, ride the camel to see the Echoing-Sand Mountain (where you will observe a very curious natural phenomenon), and then proceed to visit the Crescent Lake. After the sightseeing, be transferred to train station for the overnight train (with soft sleeper) to Turpan. Transfer to your hotel from the train station. After breakfast, drive to visit the Suleiman's Minaret (aka Sugong Pagoda), the Grape Valley, the Karez Channels and Astana Tombs, lastly, pass through the legendary Flaming Mountain. After breakfast, transfer to Urumqi. Then visit the Terai Camp, Mount Nan Pasture (aka Nanshan Grassland). In the morning, take flight to Kashgar. Check into the hotel, and then visit the Etigar Mosque, Sunday Bazaar, and the Abakh Khoja Tomb. Make a full-day excursion to the beautiful Karakuli Lake. Fly to Urumqi, and then fly to Beijing. At the Beijing airport, be met and transferred to the hotel. Say ""Zai Jian"" (good-bye) to your guide and driver at the Beijing Capital International Airport. ·All transportation, transfers and tours with private guide and car or van in each destination. Hi anne-marie maurer, we have many tour guides speak French, but in our office, only 3 of my colleagues speak French, and they are just in charge of our French website, they don't handle the inquiry from our English website. This morning one of our English-speaking travel consultants may have sent you an email for this package tour, please check your email latter. Thank you for the kind inquiry. Do you speak French ? We are interested to take a tour of 10 days. What is your quotation ? Hi Jenny, one of our travel consultants will give you some helpful advice soon, please check your email latter. Thanks for the kind inquiry. I'm interested to take this tour of 10 days, but can you advise if we can travel in March/April and how much it is? There may be only 1 girl and 3 guys going, so how to share a twin room, since we're all friends, no couples. Pls. advise! 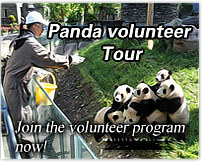 Hello Vi Tran, we've sent you the cost for this package tour, please check your email on time. Thank you for the inquiry. Hello, How much will this 10 days silk road tour cost for one person traveling on Oct 19? Thank you so much for your help!